San Francisco, CA, WH Press, 3/31/19- WR48 #1 Catriona Casey was honored with WPH Yellow for winning her 16th WR48 title at the 2018 Tucson Memorial, with the ceremony taking place at the Olympic Club just prior to San Francisco’s R48/WR48 stop. Casey defeated WR48 rising star Ciana Ni Churraoin in the ’18 Memorial final, maintaining her dominance on the WR48 tour and extending her lead in career Race 4 Eight titles (16). 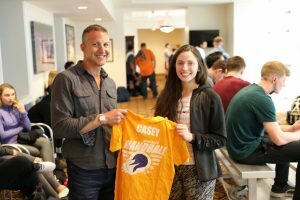 Casey would add her 17th WR48 title in San Francisco, defeating Ni Churraoin in the second consecutive WR48 final.